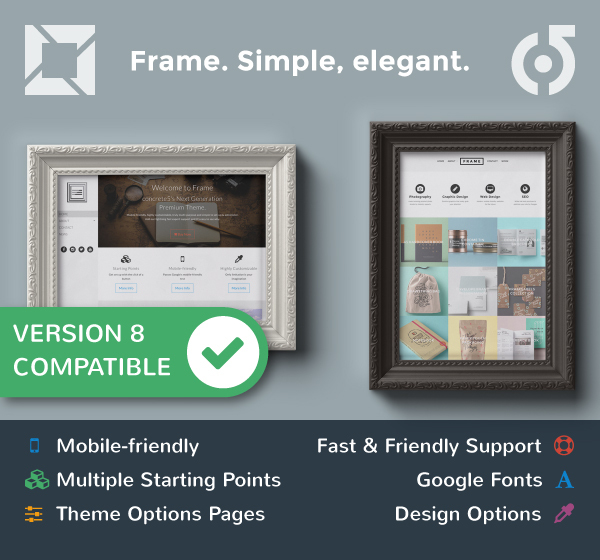 Frame is mobile friendly delivering a fabulous mobile browsing experience. Frame includes 5 page templates which, when combined with concrete5's layout tool, provides for almost infinite design choice. Frame is so so simple to use - we provide 3 additional blocks - concrete5 core blocks will do most, if not all, of what you need. Built on Foundation 6 framework, the codebase of which is half the size of Foundation 5! Active in the community since 2008, our themes and add-ons are professionally developed and backed by professional and prompt support.